The 56th Venice Biennale opened to the public last week on 9 May. Entitled All the World’s Futures and curated by Okwui Enwezor, this year it features the work of Chelsea College of Arts alumni Chris Ofili and Steve McQueen, as well as Camberwell, Chelsea and Wimbledon PhD student Samson Kambalu. 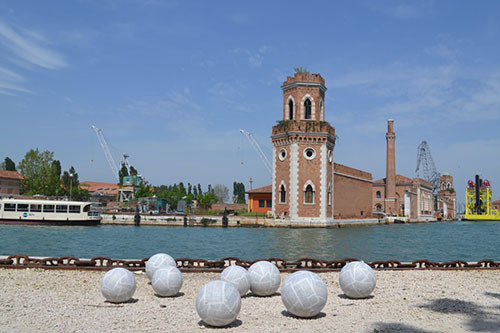 Samson is presenting three projects at the Venice Biennale this year: Nyau Cinema (Hysteresis) in the Giardini, Sanguinetti Breakout Area at the Arsenale and The Last Judgement Venice in the Giardino delle Vergini, which is made up of 400 soccer ball covered with pages from the Bible. Chris Ofili is showing new paintings, described by Andrew Russeth on Art News as “stunning, mysterious” while Steve McQueen exhibits a new two-channel video, Ashes (2014–15). Also appearing at the 56th Venice Biennale are UAL Chair of Black Art and Design Professor Sonia Boyce, UAL Chair of Global Art Isaac Julien, Wimbledon MA Drawing Course Director Tania Kovats and Camberwell MA Book Arts alumnus Tsang Kin-Wah. Read more about UAL at the Venice Biennale on the University news blog. Read our interview with Samson Kambalu on the Chelsea blog. Find out more about studying Fine Art at Chelsea on our course pages.